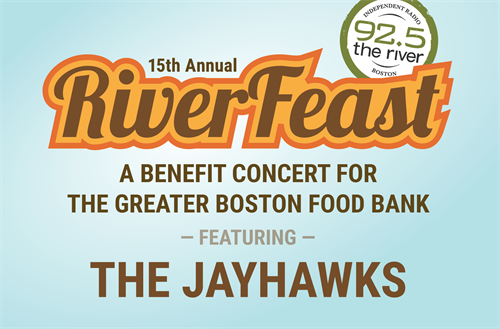 It's the 15th Annual RiverFeast benefit concert, presented by 92.5 the River and their sponsors. This year's headlining band is The Jayhawks! Also featuring a special guest appearance by Billy Raffoul. Located at the Blue Ocean Music Hall and Event Center, this event features a cocktail reception, silent auction, harvest-themed buffet dinner, and great music from a headlining artist! All net proceeds benefit the Greater Boston Food Bank, whose mission is to end hunger in eastern Massachusetts. Emerging from the Twin Cities music scene in the mid-80s, The Jayhawks are a Minnesota band that has been making great music since 1985. Their unique sound habitually transcends any label - Americana, Roots Rock, or Alt-Country. You know them from their hit songs including "Save it For A Rainy Day," "Waiting for the Sun," "Bad Time," "Blue" and "I'm Gonna Make You Love Me." Now 34 years after they formed, and 24 years in their current line-up, The Jayhawks have again released a new studio album this summer. "Back Roads and Abandoned Motels," the latest addition to the band's varied catalog, expands the group’s repertoire with brand-new recordings of songs that frontman Gary Louris has co-written with other acts. The record features their own interpretation of some of Louris' original songs including Dixie Chick's "Everybody Knows" and "Bitter End," Natalie Maines' "Come Cryin' to Me" and more. It also includes some previously unrecorded songs that were written by or in colaboration with other well known performers including Emerson Hart of Tonic and Johnny Cash. This latest album doubles down on the Jayhawks’ thickly-stacked harmonies and melodic muscle. The final result is a record that Jayhawks fans, both more recent converts and those with longer memories, will love.